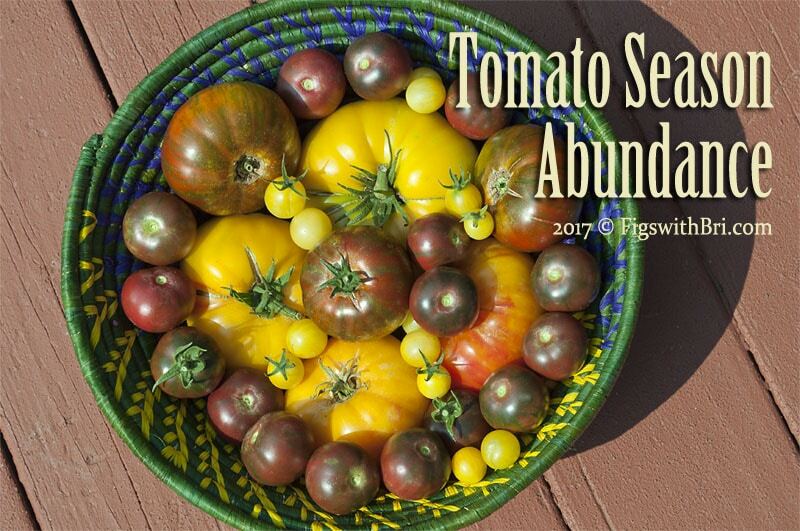 September 2017 ~ Tomatoes overrun Arizona gardens in late summer. We were warned! Oven dried tomatoes are an easy way to preserve the luscious bounty. Being experimentally inclined, Mud-and-Water Woman planted 9 types of unusual tomatoes: Berkeley Pink Tie-Dye, Black Vernissage & Indigo Rose (both best used as sauce tomatoes, delicious dried), Chocolate Miracle, Chocolate Stripes, Pineapple (a lovely yellow bicolor beefsteak tomato), PawPaw (another big beefsteak yellow), Blue Beauty, and a yummy Ivory Cherry of an unknown cultivar purchased at the Prescott Farmers Market. The garden grew beyond our expectations! Similar to a tropical jungle with towering plants so dense, we considered using flashlights to find and harvest hidden veggies. 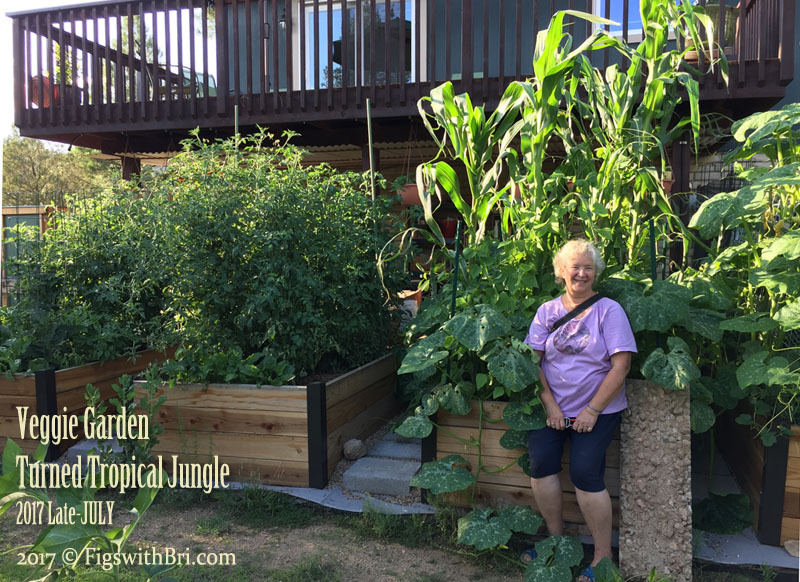 Mud-and-Water Woman with her garden 10 weeks after planting. Now, in mid September as the other fruits and veggies decline, tomatoes are swelling and ripening at an astonishing pace. A good thing…since our first frost date is only a short 5-1/2 weeks away. BUT we can’t eat them fast enough! In browsing our cookbooks and ‘googling’ recipes for tomato jams and chutneys, came across many easy recipes for oven dried tomatoes to add to pizzas, sauces, or to eat straight as savory winter treats. ~ Use whatever tomatoes you have, not just paste and Roma as most recipes suggest. Small tomatoes, cut in half with the cut side placed up. Slice large beefsteak tomatoes into 4-6 rounds. The ends will take longer to dry. ~ Don’t bother seeding them. It’s a waste of time. ~ Sprinkle the sliced tomatoes with a bit of Himalayan salt, dried marjoram & basil, and coarse ground pepper. ~ I used parchment paper lined cookie trays with tomatoes spread densely in a single layer. ~ Started the oven at 210F as recommended in one cookbook, but later lowered the temperature to 150F to finish the process. ~ It took HOURS! 6-8 hours (up to 12 hours), depending on the size of the tomatoes and juiciness. ~ I’m storing the tomatoes in zip-lock baggies in the freezer as they are moister and chewier than store bought ones. 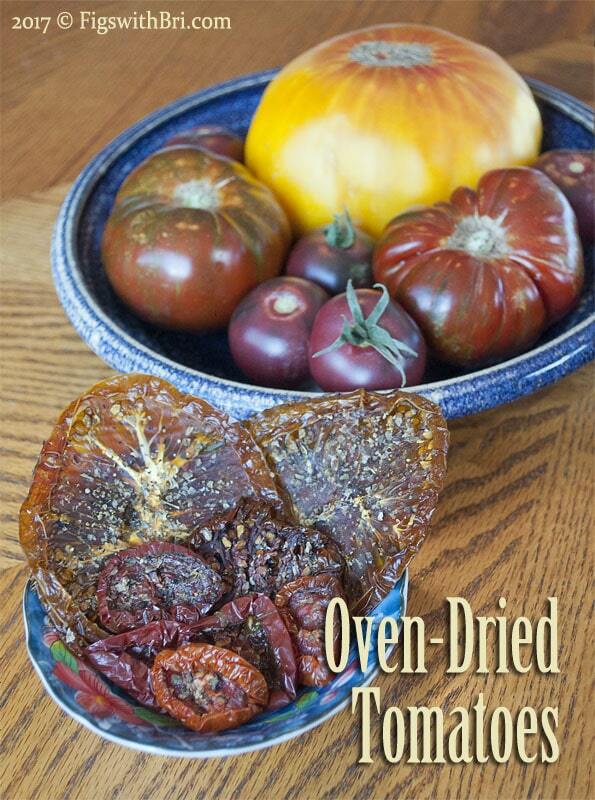 Give oven dried tomatoes a try! You won’t regret it.